What's the best time to visit Beijing? Many people have this question when they go to the ancient capital city for the first time. Although you can enjoy different scenery in each season, but the best time to visit Beijing is surely in the autumn from September to October and early summer from May to June. The peak season starts from April and ends in October. In this period, the mild temperature and climate is very suitable for travel. As a result, the city is filled with lots of travelers and is unavoidably crowded at some popular sights. The travel cost will also be a little higher since many scenic spots have peak season prices. Nevertheless, while this is the peak season it is still the best time to visit Beijing for the most beautiful scenery. The slack season for Beijing is from November to March when the weather is becoming colder and colder and there are fewer tourists. Accordingly, the airfare, hotels and scenic area tickets cost less. Beijing in January and February is cold with the temperature as low as -10 C, so it's very important for tourists to keep warm from winter chills. Nevertheless, you may enjoy the snowy landscape of the city and have a good time since it will be less crowded in most of the tourist spots. Try to avoid the two busiest travel peaks of the year – the Chinese New Year in January or February and the Chinese National Day Holiday from October 1 to 7. During these two 7-day holidays, there will be large crowds at tourist attractions and you can’t really enjoy yourself. The airfare and hotels might cost three times more than usual, and it is extremely hard to buy a train ticket during the Chinese New Year. It is also better to avoid some 3-day public holidays like the Qingming Festival in early April and the Dragon Boat Festival in June. If possible, try to avoid the summer vacation from July to August, where there will be a boom of student and family trips. The spring weather is generally mild but windy, and there will be sharp temperature difference between day and night. 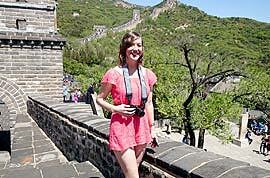 Recommended tour destinations: Hiking on the Great Wall and boating on the Kunming Lake are good choices. Beihai Park is also a nice destination for visitors to boat and appreciate some old buildings. In addition, you can take a short trip to the Beijing Arboretum, which holds some natural displays including China's largest Rose Garden. Beijing's summer is sultry and rainy, and the temperature can reach 40 C.
Recommended tour destinations: In the summer you can visit some cool places like the Summer Palace and the Mountain Resort of Chengde, which were the resorts of royal families in the Qing Dynasty (1644 - 1911), where you can enjoy the exquisite landscape design and the splendor buildings. Also, the lotus flowers in the Mountain Resort of Chengde bloom from July to September and are very beautiful. In autumn, it is less rainy or windy in Beijing and the leaves are changing colors. Recommended tour destinations: October undoubtedly is the best month to visit Beijing. The most attractive scenic spots in autumn include the Badaling Great Wall, Fragrant Hills Park and Wuling Mountain (Frog Mountain) in the suburb of Beijing. Don't miss the Fragrant Hills Park, where the red maple leaves are like fire. The best time to enjoy the maple leaves is from mid October to November. Beijing’s winter lasts for 4 to 5 months and the climate is very dry. Be sure you come prepared to keep warm and moisturize your skin if you visit the city in winter. It is not the best time to travel to Beijing, but you can enjoy different activities and the cheaper prices of the slack season. Recommended tour destinations: Badaling Ski Resort, Yuyang International Ski Resort and Jundushan Ski Resort are recommended for the skiers. For people who are not interested in skating or skiing, viewing the snow on the Western Hills and the Forbidden City can be very enjoyable. In addition, don't miss the temple fairs if you are here during the Chinese New Year. What would the weather be like at End March in Beijing, is there much rain? It may be cold in the morning and at night. At noon, it may be sunny and warm. There is less rainfall but more wind. You are advised to prepare jackets, thin sweaters, jeans and sneakers. Would you please guide me about day care or kindergarder near CAS? I am coming for a year at Beijing with two toddlers. Would you please guide me about day care or kindergarten near Chinese academy of science? You are suggested to take them to Beihai Kindergarten in 22 West Dianmen Street, which is about 8km to Chinese academy of science. You can take Bus 13 to Beihai Biemen, and then you will see the kindergarten. ok thank you so much for your kindness. we are travelling to beijing with infants on end of november. what to expect? how cold it will be? is it safe to bring baby below 6 months old during winter season? According to former data, it may be 10C below zero to 5C with haze, so you are not suggested to bring baby outdoors in such weather. By the way, you need to take your sweaters, heavy coat, gloves and mask. Well, you need to bring the sweaters, down coat and a heavy scarf. Have a nice trip! We are cruising Beijing and Japan for the month of November. What will the weather be like? The temperature of Beijing may range from 30 F to 45 F in November. The climate would be cold and dry. And there may have several snow days in the middle of the month. You are advised to bring enough warm clothes, such as down jackets, sweaters, pants and long johns.